The Adjusted Present Value method for the valuation of an enterprise is a variant of the WACC method. Both the Adjusted Present Value method and the WACC method are so called Discounted Cash Flow methods. 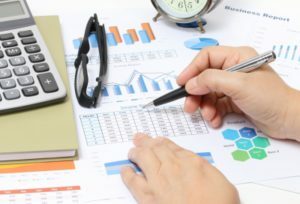 The two major steps in the Discounted Cash Flow methods are (a) the determination of future free cash flows FCF and (b) the adjustment of these FCFs for the time value of money. This seems to be easy. But in practice, there are many different approaches based on a wide range of considerations with many associated roadblocks. These may obstruct to come to a correct and well-understood valuation outcome. Thus, making the Discounted Cash Flow method a real challenge for business valuators. But with help of a bit of knowledge and understanding, we may successfully accomplish our valuation projects. In the article about the WACC method, we managed to determine the future free cash flows. And more specific, the free cash flows to the firm! In particular (a) by making financial forecasts over the forecasting period and (b) by making credible assumptions about the remainder period. Then we adjusted these FCFs by using the Weighted Average Cost of Capital WACC. In which the WACC is a discount rate representing the required rates of return of all providers of capital, i.e. interest bearing debt and equity. But, what is then different in the Adjusted Present Value method? Let me try to give some explanations! For that, we have to look at the theorems of Modigliani and Miller. They researched the influence of the capital structure on the enterprise value. Modigliani and Miller concluded that the enterprise value is independent of the capital structure. In scientific literature, this is denoted as the so-called capital-structure irrelevance. So, one may conclude that the value Vu of an unlevered enterprise (i.e. only funded by equity) is equal to the value Vl of a levered enterprise (funded by both equity and debt). In formula this would then be Vu = Vl. In which Vu is the value of the unlevered firm and Vl the value of the levered firm. There are no bankruptcy costs or agency costs. Bankruptcy costs arise when the company is over-levered: almost entirely, or at least too much financed with interest bearing debt. The company then lacks a sufficiently strong equity base. Which makes the company vulnerable for setbacks. The borrowing rate on debt will then rise due to increased risk of bankruptcy. In which D is the total amount of the interest bearing debt and f the profit tax rate. So, if no profit tax exists, then -in accordance with the theorem Modigliani and Miller- the value of the levered enterprise is equal to the value of the unlevered enterprise. The WACC method for enterprise valuation has a fundamental weakness. That is that this Discounted Cash Flow method does not take the changing capital structure into account. In the WACC method, the future free cash flows are discounted, using one invariable Weighted Average Cost of Capital (WACC). In practice, the capital structure is variable – and especially for SMEs. Corporate loans are attracted and repaid. The total amount of debt in SMEs fluctuates relatively strong, compared to large companies. By applying a single WACC, based on the capital structure, valid at the valuation moment, we ignore later changes in the associated altering total cost of capital in the following years. By applying the Adjusted Present Value method, the effects of this variable capital structure are taken into account more precisely. Next to this fundamental weakness, there is a second disadvantage of the WACC method. The enterprise valuation outcome is the result of an iterative process. By applying the Adjusted Present Value method, we avoid this complicating iteration. The Adjusted Present Value method therefore is much more straight-forward. And future cash flows during the remainder period were (rounded) 512. This appears to be a bit less than the levered enterprise value, when applying the WACC method, i.e. 3025. And since we developed some insight in discounting future cash flows, this should not be a surprise. Because, using the WACC method, we adjusted all future cash flows with a WACC of 15.47%. Which is a more optimistic (based on less risk) discount rate. No wonder that now we end up with a lower value with the aid of the Adjusted Present Value method. The total amount is 73. But like future cash flows, we must adjust the future tax returns for the time value of money. So, then the question is, which discount rate is applicable then? Normally, the interest rate is applied. The risk in receiving tax returns is normally low. Especially in environments with stable tax regimes. So, if we do so, we end up with a total net present value of all future tax returns of 50. Herewith, we add the outcomes and calculate a total enterprise value of 2942 plus 50 is 2992. Which is pretty close to the valuation outcome with the use of the WACC method, i.e. 3025. But yet, how can this (small) difference be explained? This should not be a too big surprise. Because –in using the WACC method- all future cash flows were discounted with 15.47%. Which was the Weighted Average Cost of Capital at the moment of valuation. But in later years, the capital structure of BriWiFra changes. In that sense that in future years, the enterprise is less and less levered. So for these later years, a higher discount rate should be applied. Which is neglected when using the WACC method. Therefore, the Adjusted Present Value method is a bit more accurate. This APV method precisely takes future capital structure changes in account! Here, I would like to make a final remark. From a practicable standpoint, the difference between the valuation outcomes according the WACC method and the Adjusted Present Value method is negligible. It only exists based on a theoretical consideration. In practice, incorrect valuation outcomes rather are a consequence of erroneous assumptions than due to –not fully justifiable- valuations methods. That is why a good understanding of the enterprise and its business environment is very much essential. This surely yields a much better foundation in developing credible valuation outcomes.